Leo Cullen’s men sealed a semi-final spot with tries from Nacewa, Conan, Henshaw and McFadden. STAR QUALITY IS not a tangible thing. It is not easy to measure, place a value on or create. But it is easy to identify. Because when you see it, you just know it. In the Champions Cup quarter-final against Premiership leaders Wasps today, Leinster showed quality in spades, but nobody showed the kind of class that Joey Carbery did. In a back-line brimming with international talent, it was the 21-year-old from Athy who made things happen and edged bums towards the edge of seats all around the Aviva. Though it was the incumbent Ireland and Lions out-half in the controlling position, Carbery happily ushered himself in to first receiver time and again. Never for a second looking rushed, Carbery’s distribution and footwork was a joy to behold and left Wasps utterly perplexed. A man of the match and champion at this venue with Clontarf less than 11 months ago, Carbery fizzed a 16th minute pass to Isa Nacewa to give Leinster an 8 – 0 lead — Jonathan Sexton missing the touchline conversion after opening the scoring with a penalty. The English side, for their part, failed to live up to the billing. Though this would have been a much tighter spectacle had Willie Le Roux (capitalising on a rare Carbery error, by ghosting through his tackle in midfield) had not unforgivably dropped the ball while diving over the try-line in the 24th minute. April Fool indeed. Leinster were not perfect, they didn’t need to be. A series of loose kicking contrived to keep that potentially electrifying Wasps backline interested. But when errors crept in from both sides in the 34th minute, it was that man Carbery who grabbed the game by the scruff. Today’s fullback collected Le Roux’s kick on halfway, evaded a tackle and popped the ball right to Fergus McFadden. A mark of all great playmakers, he tore the defence asunder when the pill came back his way, unleashing Jack Conan around the corner and over the line. It was a deserved score for Conan, a colossus on the day, making breaks and yards for fun and keeping a muscular English back row firmly on the back foot. Even when the visitors did get a maul going, in an effort to force their way into Leinster territory before the interval, Leinster thwarted them. For once, Carbery was not involved as Dan Leavy forced a turnover and slick passing from Tadhg Furlong, Sean O’Brien and Jonathan Sexton put Robbie Henshaw away on a powerful scoring run. A 22 – 3 deficit faced the Premiership leaders in the second half and to their credit, they bore into it. Ashley Johnson was sent on to add some oomph to his team’s carrying option, but he floated a fine pass over the head of Isa Nacewa to give Christian Wade all the time and space he needed to finish in the corner. Though Leinster never quite took the foot off the pedal, there was a caution in their attack compared to the frenetic flow of the first-half. And after repelling a pressure that would have killed the contest, former Leinster 10 Jimmy Gopperth slipped in between replacements Ross Molony and James Tracy and flung himself over the whitewash. Suddenly, we had an eight-point game. The 50,266 in the Aviva Stadium had fingers to cross and the men on the field had a grip to maintain. Clench they did, the baton left in the hands of the powerful forwards rather than the young tyro at number 15 as Leinster built late pressure, dominating ball and territory until a Devin Toner carry allowed McFadden, an early replacement for the injured Adam Byrne, to seal the victory. The win puts Leo Cullen’s side in the last four of the Champions Cup, but also on the road. The three-time champions will have to travel to France for the semi-final later this month. Where exactly will depend on the outcome of tomorrow’s clash between Clermont and Toulon. Email “Carbery takes command as Leinster see off Wasps in European quarter-final”. 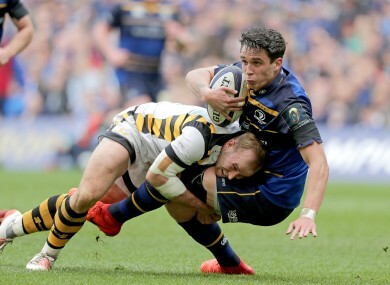 Feedback on “Carbery takes command as Leinster see off Wasps in European quarter-final”.